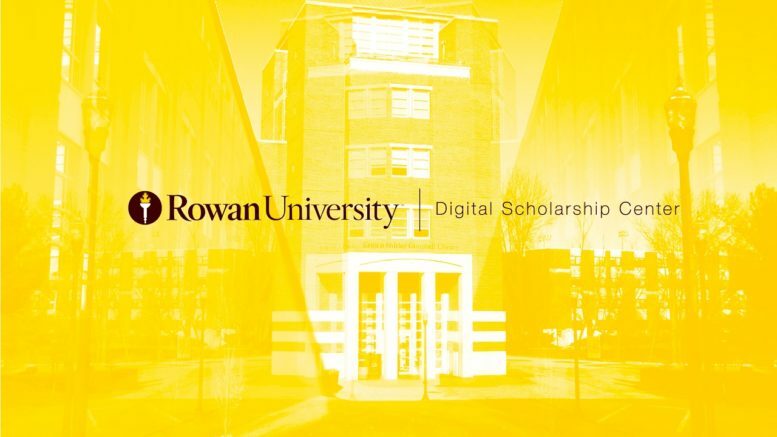 Rowan’s Digital Scholarship Center (DSC) is a campus resource available to anyone in the university community. The center’s focus revolves around helping students with digital projects, creating archives and primary resources, providing educational workshops, and inspiring creativity and collaboration. Mike Benson, the Coordinator of the DSC, provided some insider information on how the center operates and the principles that serve as its guide. Joe: Can you touch on the history of the Digital Scholarship Center? Mike: Originally, this space was just for books. Probably about ten years ago, the university turned it into an area that folks could come in and do digital editing, convert their VCR cassettes into DVD, that type of thing. From there, it evolved into something that they called the Digital Learning Center, and that’s when they actually installed the rooms and then they also bought computers. It kind of became a place where people could go and write papers and get help with papers and projects and things like that. I took over in the summer of 2016. At that time, it had been a Digital Scholarship Center for a couple of years, but from the transition from Digital Learning Center to Digital Scholarship Center, the mission really didn’t change. It was mostly a name change. But then they hired a librarian and she was going out and talking with faculty and working with them on projects inside their classrooms, not specifically in our space that was here. I decided to shift the mission and that was partially inspired by the library administration. They wanted the Digital Scholarship Center to focus a little more on projects and start doing workshops in the space. I took that concept and developed it into something that focuses on building a consciousness of creativity on campus. Also, a consciousness of collaborating and how important it is to collaborate with folks to develop new ideas and help build skill levels. Our focus is on curating and developing digital scholarship projects, which are basically projects that deal with primary resources. The project could be a primary resource, but it could also be an archive. We develop digital scholarship projects and we also develop educational programs, which would be the workshops and the talks. 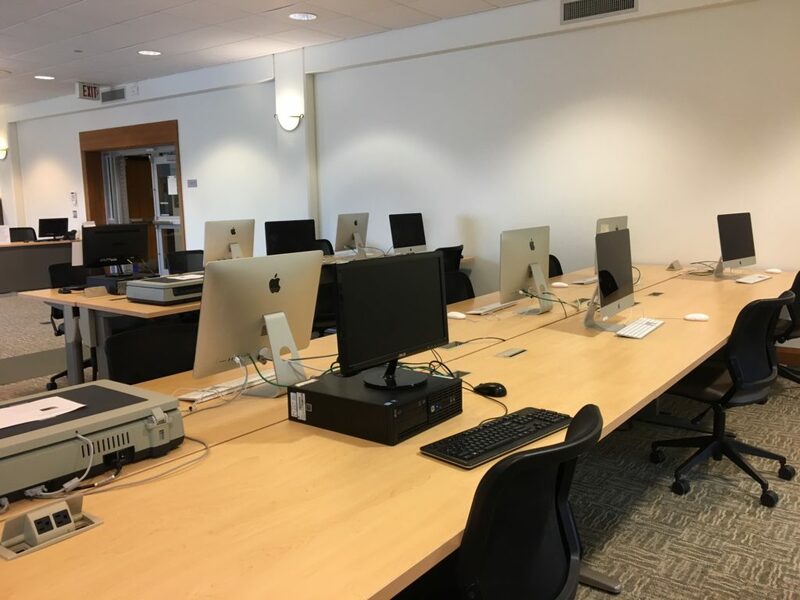 Then we also have the physical space, which is more focused on having people come in who might need help with writing particular software, or need help on digitizing work or developing a video. Joe: Who works with you in the center? Mike: We have student workers. Right now we have about five of them. They’re students who have a pretty good skill level, but more importantly they’re just enthusiastic people about technology, history, and scholarship. And then we also have an interactive design person we hired last spring. She’s our main interactive web designer, who designed the Glassboro Summit website and various oral history projects. As far as faculty, we collaborate with Rowan faculty members. Right now, we’re collaborating with people from the art department. We’re working with geography and university publications. We’ve worked with university public relations in the past. We’ve worked with writing arts and are currently working with anthropology on a project to digitize slides. Joe: Can you talk a bit about the Glassboro summit project? Mike: The Glassboro summit was a historical event that happened in the summer of 1967 where President Johnson and Premier Kosygin came to Rowan. What this project does is create an online archive of a lot of the material that was created at the time. There’s some video, a lot of photography, and letters that went back and forth between the White House and various people here on campus. A lot of that material is up on the site and there’s a lot more in the special collections archives, which is on the third floor of the Campbell Library. There’s been conversations about digitizing a lot of that stuff, but there’s copyright issues we need to resolve before that stuff can go up. Also, we need to have time and funds to make the project happen. The images and the video that are up there already are images that were mostly digitized through university publications and it was part of their collection. They were very generous in helping us get this project up. It’s basically providing primary source material to folks who might want to research what happened at Glassboro State summit. Anyone in the world can access it. All the projects that we do in the Digital Scholarship Center are meant to be inclusive to everyone. Joe: Do you have any tips for someone who would want to start their own Digital Scholarship Center? Mike: That’s a really tough question because to be able to create this kind of environment, you need to have tie in from a wide variety of people on campus. One, there has to be a need for it, so you’d have to do an analysis of what the needs are on campus. A conversation about what the needs and gaps are needs to take place. From there, you just have to have a centralized location. A library is the perfect place for that. On the Rowan campus, it’s centrally located, but it’s also a place where people are kind of free to come in and out. It’s not owned by any particular department. It’s owned by the university, so it’s a non-territorial kind of place. So that’s another important thing that I think other schools should consider. I also say that our space is inclusive. What I mean by that is not just gender, race, or identity, but it’s inclusive to all different academic programs. Other departments have their own areas that are just for their own group of majors. Our space is open to all of them. We feel that it creates a more dynamic environment, because you get engineering students in the same room as art students, and you get communications students working with humanities students. When that happens, you just get ideas flowing all over the place. Our focus is really on developing creativity, changing the climate on campus so that people think more about creativity. The Digital Scholarship Center is all about helping people realize their creativity and become more creative through our various programs. It’s alo about collaboration, because you can’t really be creative in a vacuum. You need to have people that you bounce ideas off of. So it’s creativity, collaboration, and a flexible space to have all of that happen. That’s where the inclusiveness comes in, and also having a space where people can just come and sit and work on their projects, have access to cameras, audio devices, and things like that. And then the fourth thing is evaluation, being able to reflect on what you’re doing and have some type of structure in place for people who can give you critique on your project to help it be better and to brainstorm a little. We do all of that here. We try to increase motivation, decrease fear, increase curiosity, try to help people be more creative, and then we also help them reflect on what they’re doing to make it better. Joe: Is there one area or technological tool or resource that people come to you most often for help with? Mike: It’s always the Adobe suite, as far as nuts and bolts. The campus has decided to not offer these tools in every single lab directly on their computers. They offer it through the Rowan cloud. Using the Rowan cloud is a great resource because it lets people have access to the software but it’s also a little problematic. It’s not the natural way people work. Over time, I’m sure that will change and people will get more used to working in that way. For us, having the software on our computers is huge because it allows people to work in the way that they’re used to working. It also depends on how you’re defining tool because you could define a tool as your brain, not to get a little cliche. In our space, we have a lot of people who have a lot of experience who are advocates for creativity and developing projects. These people are probably the greatest resource over everything. That not only includes the people in the DSC, but also the librarians. Come in, get to know us. We’re happy to help. Joe: With all of these programs and their nuts and bolts, how do you stay up to date and remember how to do everything? Mike: The secret is you don’t stay up to date. You’ll never be able to stay up to date with anything because it’s changing so fast. In Photoshop, there’s so much you can do that it’s almost a full-time job just learning it all. The key isn’t really being an expert in any one program or all the programs. The key is knowing where to get the answers and being able to find the answers for what you want to do. Over time, you’re going to develop the skillset that you can pretty much figure things out on your own. Or, you’re going to have to look it up. Our world is no longer this world where we have all this knowledge in our heads. We have some knowledge, but we really need to access a library, or sources like lynda.com, or the DSC, that have resources that can help us solve that problem. Part of being creative is also part of being collaborative. It’s talking with people who might have an answer, developing that network of people around you. The key is to keep moving forward. For me, I’m no expert with editing video. I go look for the resources, read them, and just go and do it. We all also have areas that we feel pretty confident in. For me, it’s photography and Photoshop, InDesign, web design, WordPress. I can get in and make things happen pretty quickly. Even in those scenarios, I need to go back and look stuff up. In our world today, it’s really about how you can find the answers and be open-minded enough to know that you can’t know everything, but you can sure as heck find it or find someone who does. Part of finding information from different resources is also being a resource to other people. If you don’t, eventually when you need an answer, you’re not going to find it. It’s not because someone’s going to keep it from you, but there’s this law out there that says if you don’t share and be open to sharing, people aren’t going to share with you. In art, if you’re an artist and you want an audience for your art show, you need to be an audience yourself and go to other people’s shows and kind of give back. Joe Gramigna is a junior writing arts major at Rowan University. He currently serves as the arts & entertainment editor for Rowan's newspaper, The Whit. Although he grew up in the digital age, he has recently realized his lack of technological know-how and is on a quest to correct this ignorance!